The OnePlus 5 was launched in June 2017 and within just five months OnePlus has decided to upgrade it. The OnePlus 5T was launched yesterday night in Brooklyn, New York and the event was live streamed online and in select theatres in India. 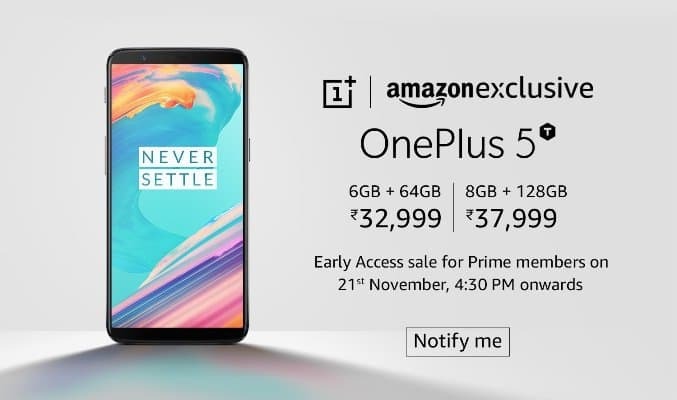 The OnePlus 5T will go up for sale in Amazon Prime Early Access Sale on 21st November 4:30pm onwards. The OnePlus 5T will be sold in 6GB RAM + 64GB internal memory variants for Rs. 32,999 and the 8GB RAM + 128GB internal memory variant will set you back by Rs. 37,999. So is the OnePlus 5T a good buy? Of course, it is, as long as you have not bought the OnePlus 5 because like all smartphones in the OnePlus series they provide flagship features at relatively lower prices. So if someone has OnePlus 5, should he/she ditch it? Find out in the following paragraphs. The biggest feature that currently all smartphone manufacturers are cramming into their flagship irrespective of its usefulness is the bezel-less display. This was the primary cause of OnePlus hurrying up and launching the OnePlus 5T. The OnePlus 5T has Full Optic 18:9 6.01inch AMOLED Full HD resolution display. 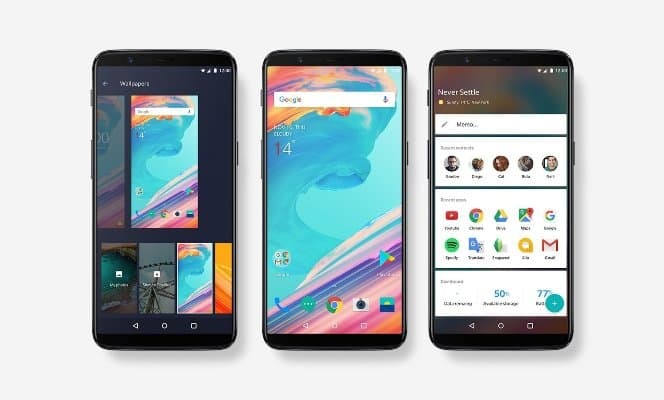 Now you might be wondering a flagship should have larger resolution than Full HD for better picture quality, OnePlus however argues that a higher resolution display might hamper the battery backup time and overall performance. It has included sRGB and DCI-P3 colour modes so that you do not notice the any flaws. As usual the display has been protected with a 2.5D Corning Gorilla Glass 5 display. Now when the Mi Mix 2 was launched we said that it had the right resolution but the wrong display but if you take our opinion go for the OnePlus 5T as you get brighter colours and darker blacks. There are also other reasons to go for the OnePlus 5T instead of the Mi Mix 2, find out in the next paragraph. The OnePlus 5T has the same Qualcomm Snapdragon 835 chipset because Qualcomm has not been able to churn a better one as it is going through some tumultuous times. The Mi Mix 2 also has the same chipset and so does the OnePlus 5 but on the OnePlus 5T you get 6GB or 8GB of RAM and as we all know OnePlus has optimised their home grown take on Android, the Oxygen OS to work seamlessly on its phones. Sadly, OnePlus has not updated Oxygen OS to Android Oreo, it still based on Android Nougat. The next biggest change to the OnePlus 5T is its cameras. You get a dual setup of 16MP and 20MP sensors coupled with dual LED flash. You can record 4K resolution videos now with the rear cameras. This is where the Mi Mix 2 fails to keep up with the competition as it has only a single lens setup on the rear. If you are thinking what the OnePlus 5 is lacking, then pay attention to the secondary lens which now has a better aperture to match the primary camera. On the front we get the same 16MP sensor that we found on the earlier OnePlus 5. Since the display had to be bigger OnePlus decided to move the fingerprint sensor to the rear and add Face unlock feature. The face unlock feature isn’t as sophisticated as the iPhone X but it gets the job done. The OnePlus 5T has a slightly smaller 3300mAh battery that can replenished faster with the help of Dash Charge. As you might have already deduced by now it has the USB Type C port but also a headphone jack because OnePlus did not want to anger its fans. As expected from a flagship you get all the connectivity options and sensors you need. We deliver out final verdict, if you already have a Mi Mix 2 or a OnePlus 5 no need to ditch it right now because you would have bought it just a few months back. If you haven’t bought any flagship smartphone and are looking for an upgrade, go for the OnePlus 5T.